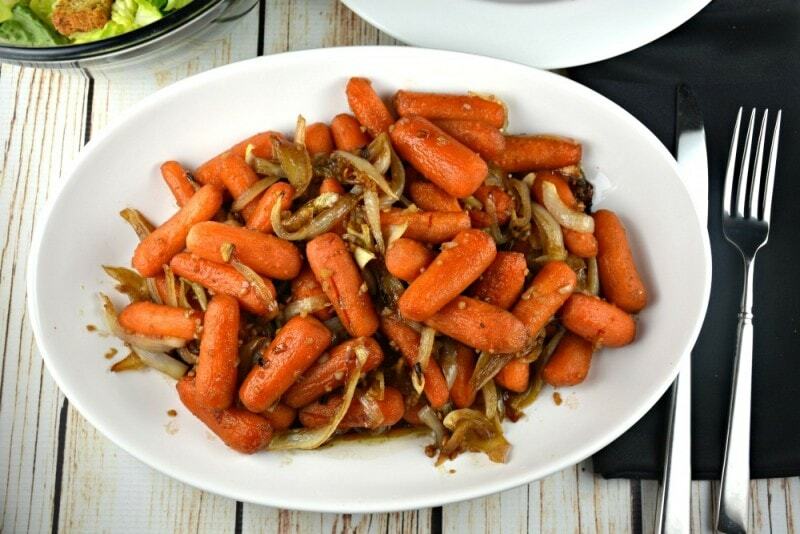 This recipe for Sweet Balsamic Roasted Carrots and Onions is so easy and super delicious! We make this dish all of the time! In the winter months I tend to use baby carrots but as soon as summer approaches I can’t help but use all of the carrots from our garden and our local market! Ken, my husband, loves buttered carrots and I think could eat them like that all of the time! I need change and this is one of my carrot recipes that I love the most! Sometimes I double up on the glaze. A little extra balsamic vinegar, brown sugar and garlic could never hurt! 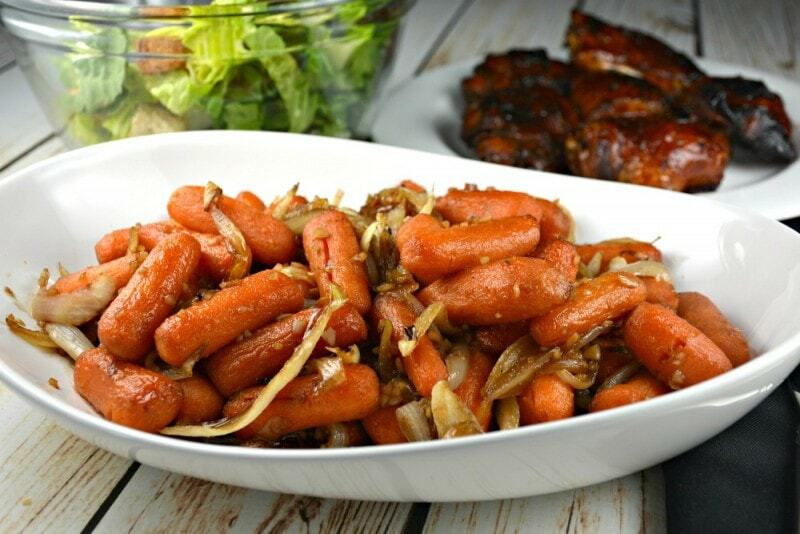 I think it makes these Sweet Balsamic Roasted Carrots and Onions taste even better! My husband thinks that this is the perfect amount! I leave it up to you to give them a try and then decide if you want more glaze or not! We always end up with so many carrots from our garden that I am always on the hunt for different and tasty ways to serve them. Here are some of our other favorites. I just had to make a video for this recipe! 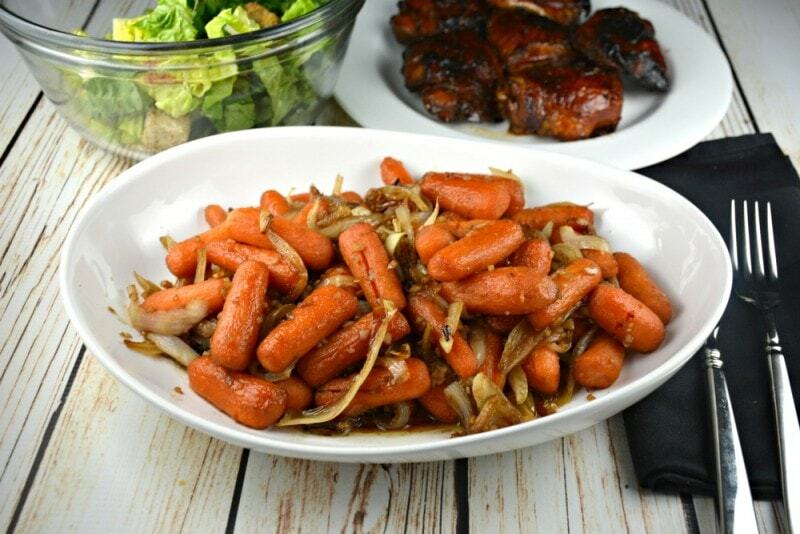 Sweet Balsamic Roasted Carrots and Onions is such a favorite in our home I thought it might be in yours too! The flavors blend perfectly together. This recipe is definitely worth a try! Take a peek at our video below. Preheat oven to 375 degrees. Prepare a baking sheet lined with tinfoil and a light coating of cooking spray. Set aside. Wash, peel and slice carrots and whichever onions you are using and place it all into a large bowl. Gently toss with olive oil until totally coated. Arrange carrots and onions in a single layer on the prepared pan. Roast in oven for 25 minutes. Combine brown sugar, garlic and balsamic vinegar in a small bowl. The mixture will be thick. Remove pan from oven. Drizzle mixture over carrots and onions and toss gently until coated. The heat from the pan will thin the mixture as you coat the carrots and onions. Return to oven for another 10 minutes and then toss vegetables again if desired. Bake for 10 more minutes or until vegetables are as tender as you like them and caramelized. Toss again before serving and season with salt and pepper to taste. Serve immediately.